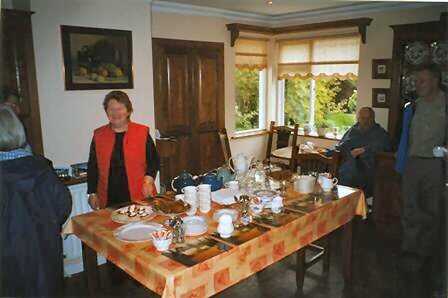 In 2005 we chose to travel to Ireland, booking for the second time with Collette Vacations. 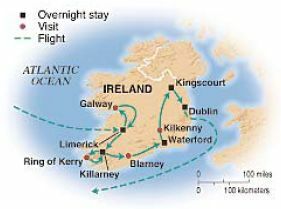 We had always heard how beautiful Ireland is, and after researching various tour groups, we once again chose Collette as having the right tour and good accommodations at a reasonable price. 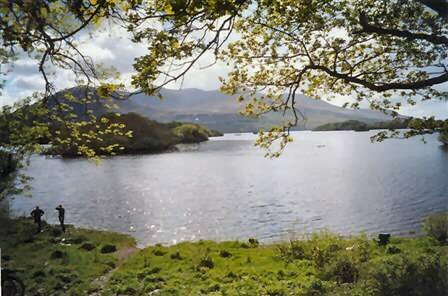 We enjoyed Ireland well enough, but the Collette tour itself exceeded our expectations. 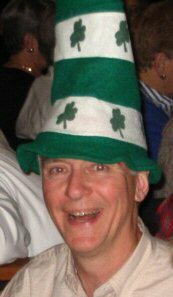 Our tour guide, Dave Cormier, was outstanding; the food, with very few exceptions, was excellent (even at a banquet hall); the hotel facilities (with the exception of very thin walls in the Cabra Castle in Kingscourt-- ironic, isn't it, in a "castle"?) 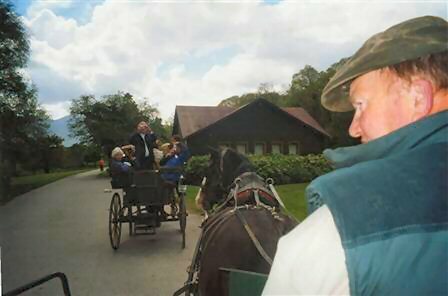 were very satisfactory, we had some great entertainment, and the tour was paced very well (last year in Italy it was paced a bit too fast for us). 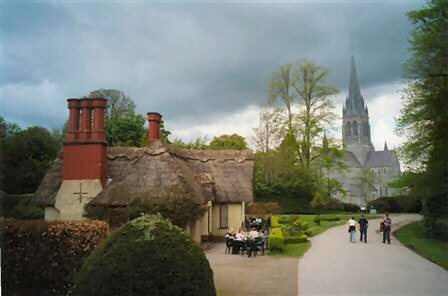 The Irish weather cooperated pretty well. We never had anything worse than light rain; and each day had bouts of sunshine among all the clouds. The temperature hovered around 50F, rising into the upper 50s at times. 28 of the 44 members on our tour were Canadians traveling together -- and what a great group of people they were! 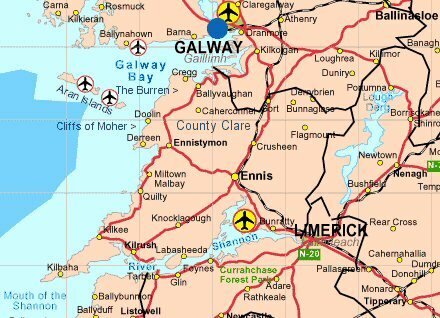 We started out in Limerick, after arriving overnight at Shannon airport. (The airport is in the middle of nowhere and not especially large.) 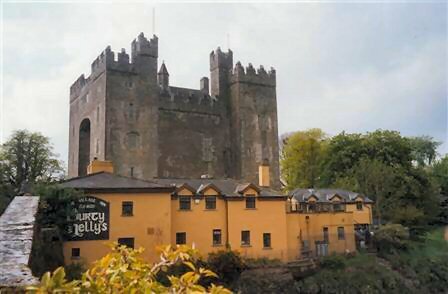 They say Limerick is not related to the 5-line poems called limericks. It is, however, the setting for Frank McCourt's 1999 #1 best-seller, Angela's Ashes, a story about the lives of the poorest of poor growing up in the slums of that city in the 1930s ( Worse than the ordinary miserable childhood is the miserable Irish childhood... -- click the book cover to order it). 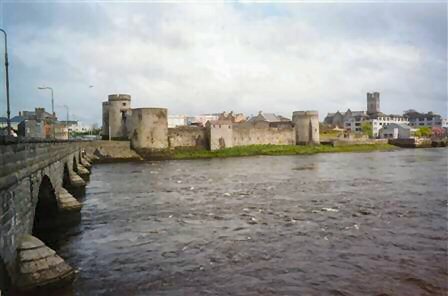 Limerick has since cleaned up its city. We walked and drove through the area depicted in the book, and it was very nice. In fact, we were impressed by the overall cleanliness of all the cities in Ireland that we visited -- very little graffiti, for example (unlike France and Italy), and clean streets. 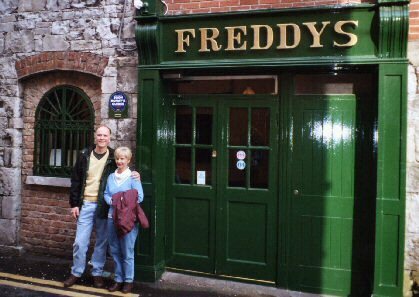 One of our favorite sites in Ireland, and particularly so in Limerick, was the colorful front doors. Local laws give residents of row houses limited ability to vary the architecture, but front doors are exempt. All over Ireland we saw brightly colored doors. The semicircular windows over the doors were interesting, too. And we couldn't resist eating our first meal at an Irish bistro with a name close to home! We visited a couple of castles in Ireland. In general, the castles were smaller than we might have expected. 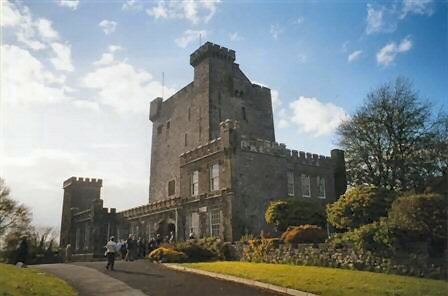 We had a banquet in this one, Knappogue Castle, with musicians and singers dressed in medieval costumes. 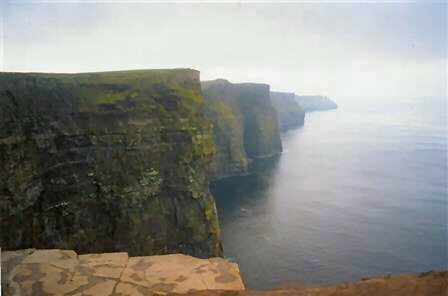 One of the primary tourist attractions in Ireland is the Cliffs of Moher. The weather was pretty dismal when we visited the Cliffs in County Clare. 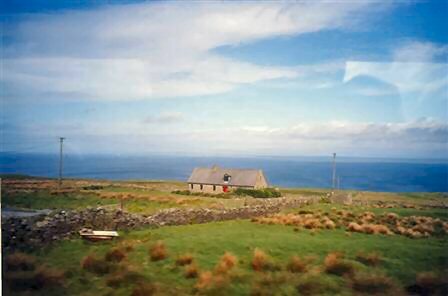 The scenes along the way to the Cliffs were pretty standard of what we saw throughout Ireland (below right) -- sparse housing, with fields separated by stone fences or hedges. 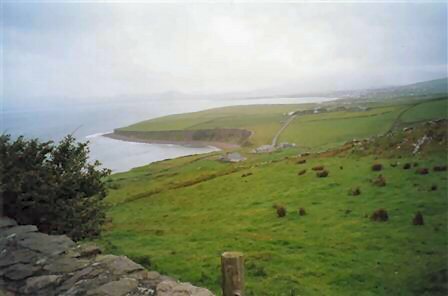 The area just north of the Cliffs is known as The Burren (not pictured), a place where the limestone is so prevalent that it sticks through the grass, interfering with farming. 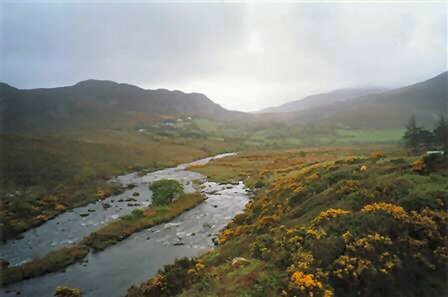 The Burren, Where there are no trees to hang a man. Where there is not enough water to drown him. And if you finally succeeded in killing him, it's too rocky to bury him. 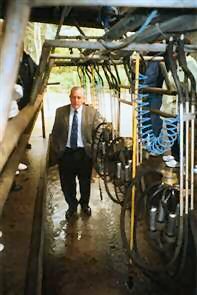 One of the most enjoyable experiences we had was a visit to a working dairy farm. 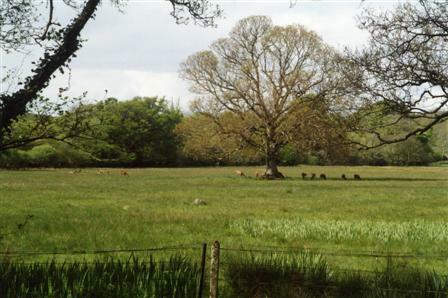 The farm has been in the family for generations, passed from father to son. 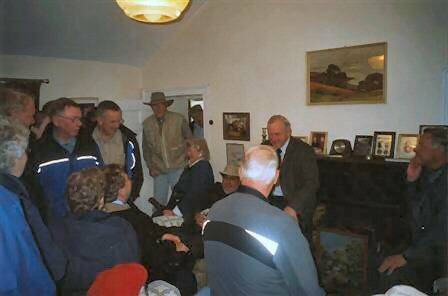 The farmer's wife prepared delicious mid-morning snacks for us, and the farmer entertained us with stories from his youth and information about Irish customs and traditions, as well as a tour of the farm itself. ( Remember, this is a working farm, so always watch where you step! ) He showed us the tiny room where he was born, showed us family treasures, and shared intimate stories of the life and death of his parents. This was a truly unique experience. 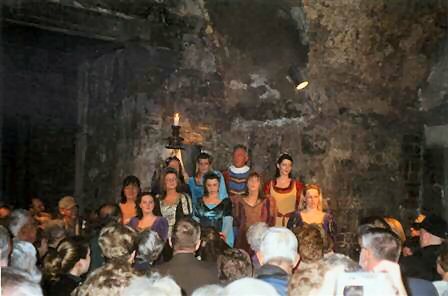 It was also in Killarney where we attended an optional performance entitled The Liam O'Connor Show. Liam, who gained fame playing with Michael Flately's "Lord of the Dance," plays the accordion like you've never seen before, and we were fascinated by his skills. 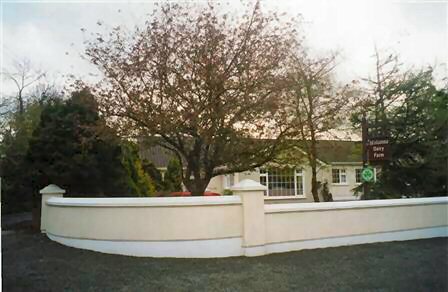 His wife, vocalist Lisa Aherne, also performed, and they are now able to live and perform under a long-term contract at the Killarney Avenue Hotel (where we stayed) near their home county of Cork. We were also taken to a local "singing pub" (The Laurels Pub) to experience some Irish songs and dance. 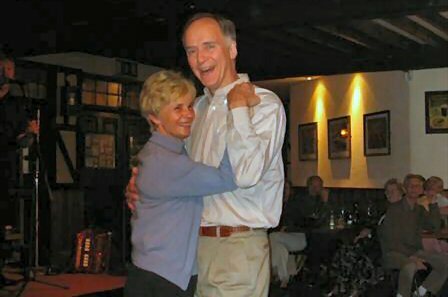 As this was our 31st anniversary, we were unexpectedly called to the dance floor! 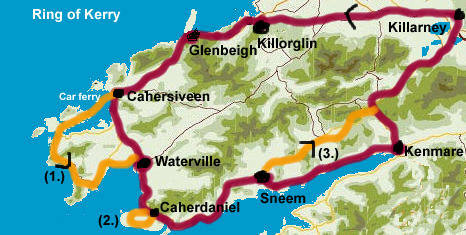 We then traveled westward around the famous Ring of Kerry -- basically a road around the perimeter of a peninsula. It is a very scenic route, though the weather was poor on the day we toured, decreasing our appreciation for the views somewhat. 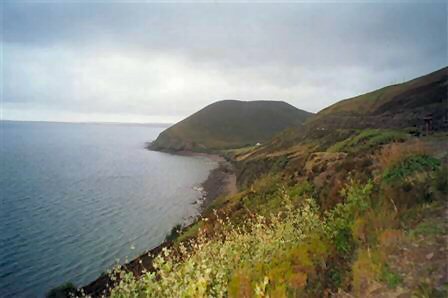 To the north is Dingle Bay (first picture below). Peat moss was prominent in this area. The peat is grown (or perhaps we should say allowed to grow), then harvested by cutting large blocks out of the soil. 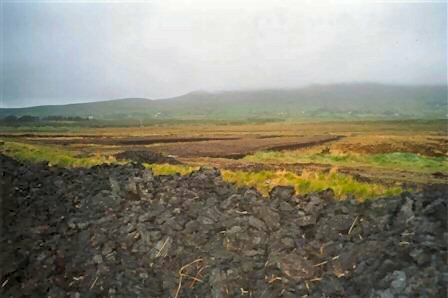 The resulting peat, when dried, can be used as fuel, though we are more familiar with its use in gardening. 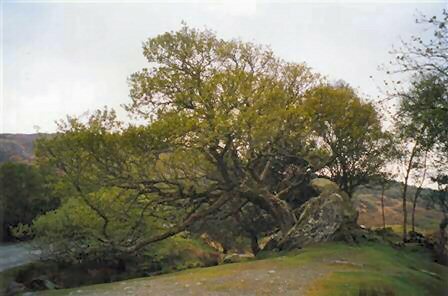 There were numerous picturesque bays to see, such as at the town of Waterville (third picture); and we ended up at the back end of Killarney National Park, where we saw the beautiful tree pictured below, growing out of a rock. 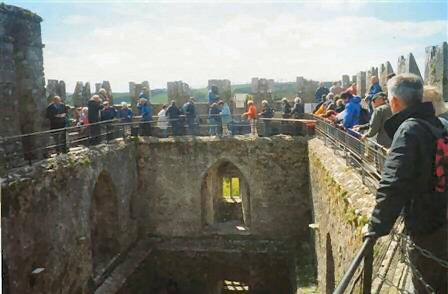 Our tour turned eastward as we visited Blarney in county Cork. 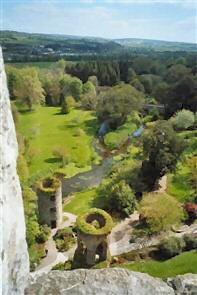 The most famous attraction in Blarney is most likely Blarney Castle and the famous Blarney Stone (which is said to give the gift of eloquence to all who kiss it). 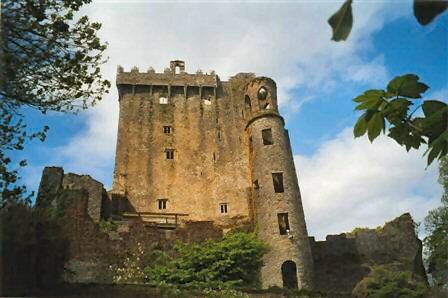 It is rather hard to picture just how one kisses the Blarney stone until you actually get there! 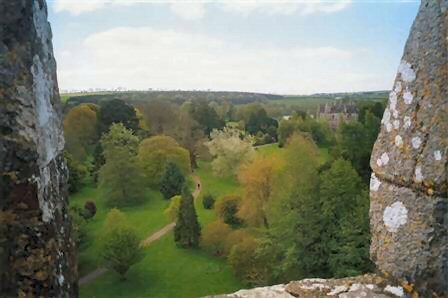 The castle and the views from the top are very scenic, though it is quite difficult to imagine having lived in this small stone fortress, fearing attack at any time. 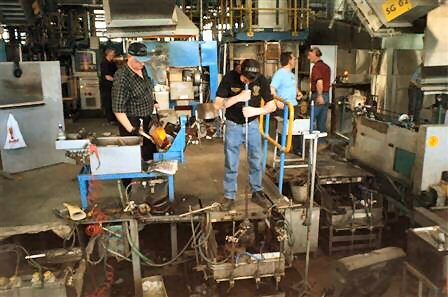 Waterford is the name of a county, city, and famous crystal manufacturer. (Kathy only cared about the last one...) The highlight of our visit there was the trip to the Waterford Crystal factory. We learned how teams of three blow, shape, and prepare the initial crystal form, passing it along for markup and engraving, and of the rigorous apprenticeship process, as well as the frequent inspections. For all the talent that this hand-cutting of crystal requires, we can't imagine doing it all day long. 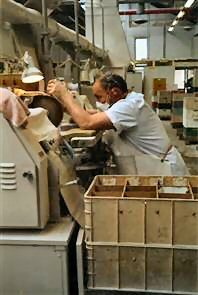 And they often do it without safety goggles or gloves, right in front of an unprotected spinning diamond cutting wheel! We also got to view magnificent works created as trophies, and we learned that they always create two, retaining one in case anything happens to the original. Trophies often take a week to engrave. As we headed toward Dublin, we stopped at the Locke Distillery in Kilbeggan, county Westmeath. 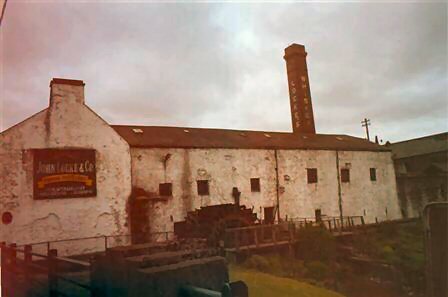 The distillery was built in 1757 and is still used to store whiskey for aging. The original equipment has been preserved and restored as much as possible for tour purposes, though actual production is handled elsewhere now. 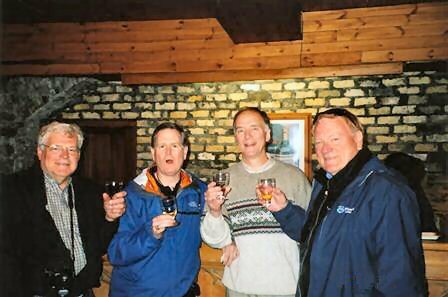 And of course we got to sample some Kilbeggan whiskey with our new Canadian friends Ted and Doug! At this point, my camera died, but I took a couple of pictures with my friend's camera. 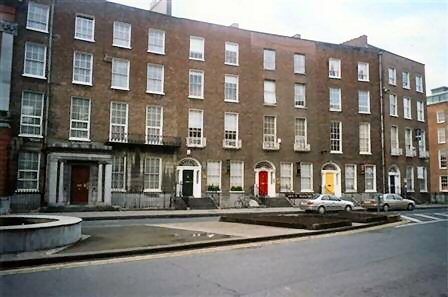 Dublin is Ireland's largest city, housing around a quarter of the country's population. It was clean and had some wide streets closed to vehicles, which is common in European cities and delightful for the visitor and shoppers. 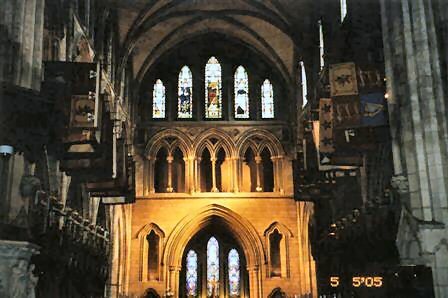 It is the home of Trinity College, where we viewed the Book of Kells (pictured left): the four gospels of Mathew, Mark, Luke, and John, created in magnificent hand-colored pages in the 6th century and considered a crowning glory of Celtic art form (see sample pages). We visited St Patrick's Cathedral, and there are also a couple of lovely city parks to explore. We ate a marvelous meal at Jacob's Ladder restaurant. We also attended The Burlington Cabaret at the Burlington Hotel, where we saw an absolutely hilarious comedian (Noel Ginnity), Irish dancers, and musicians and singers. The meal was excellent too -- highly recommended. 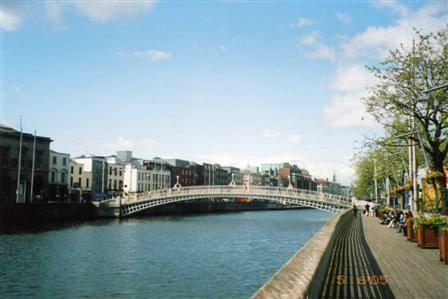 Below are pictures of the Ha'penny Pedestrian Bridge (one halfpenny, the original fee to cross, later increased but not terminated until 1919) over the river Liffey, and St Patrick's Cathedral. The End. Thanks for joining us!